Narrow gauge car "Wandana" was former Long Tom car "219", converted to a first class lounge car for the East-West trains. 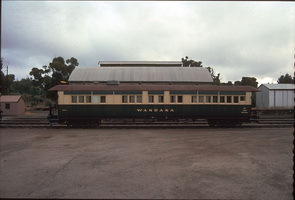 "Wandana" began its life as body "181" and underframe "219". narrow gauge carriage "181" was built in 1911 and in 1926-7 it was converted to broad gauge car "493", and in 1942 swapped bodies with SA&CR Joint Stock car "219" for use on the Terowie to Port Augusta service. 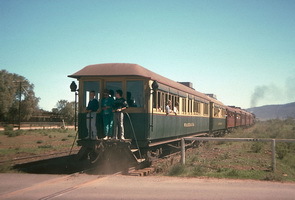 At the time of the body swap "219" was fitted internally with 36 bunks for use on hospital trains between Alice Springs and Terowie. 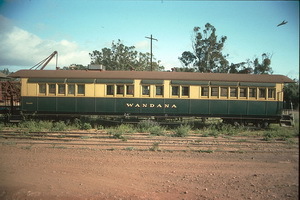 Wandana was fitted out in 1942 as a ward car for conveying the sick and injured. It contained bunks in three tiers so as to convey 36 patients. In 1945 it was refitted with longitudinal seating and transferred to the South East Division, then in 1958 it was issued to the Port Lincoln Division as relay van "209", and finally purchased by Pichi Richi Railway in 1974. At Quorn Pichi Richi Railway repainted it in the green and cream livery of the Port Lincoln division cars and rebuilt it internally as a buffet car. Note: This car never ran with the name Wandana in South Australian Railways service. See also: Wandana (South Australian Railways). 12.1911 Entered service as body "181". 1919 Entered service as underframe "219". - Converted to a first class lounge car for the East-West trains. 1926 Converted to first class broad gauge car "493". 1926 Converted to second class. 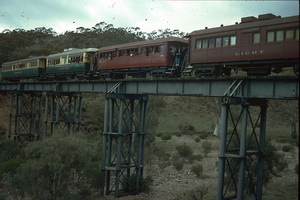 1942 Swapped bodies with car "219" for use on the Terowie to Port Augusta service. 1942 Fitted out as a ward car for conveying the sick and injured. It contained bunks in three tiers so as to convey 36 patients. 1945 Refitted with longitudinal seating and transferred to the South East Division. 1958 Issued to the Port Lincoln Division as relay van "209". 1974 Purchased by Pichi Richi Railway. - Named "Wandana" by Pichi Richi Railway.